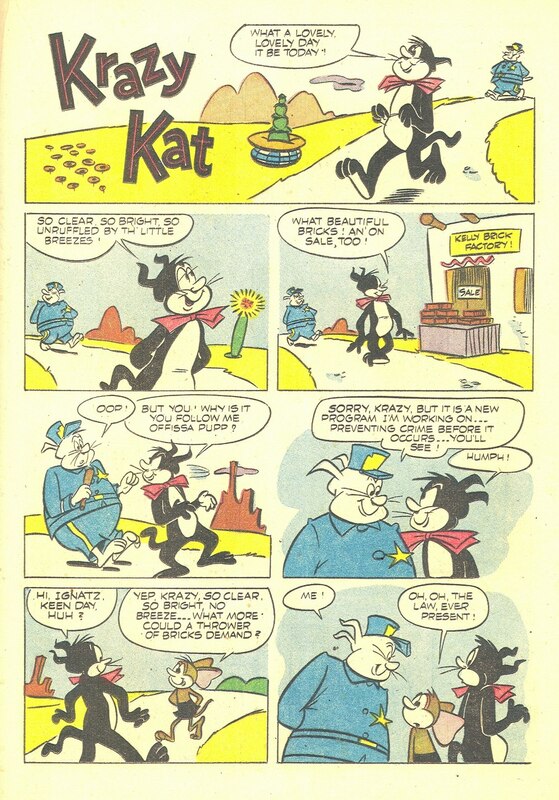 It's been a while since we looked in on John Stanley's version of Krazy Kat. 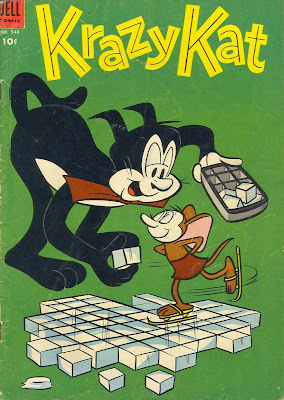 Thus, here are three stories (and a cover) from one of the mid-1950s one-shot KKs. 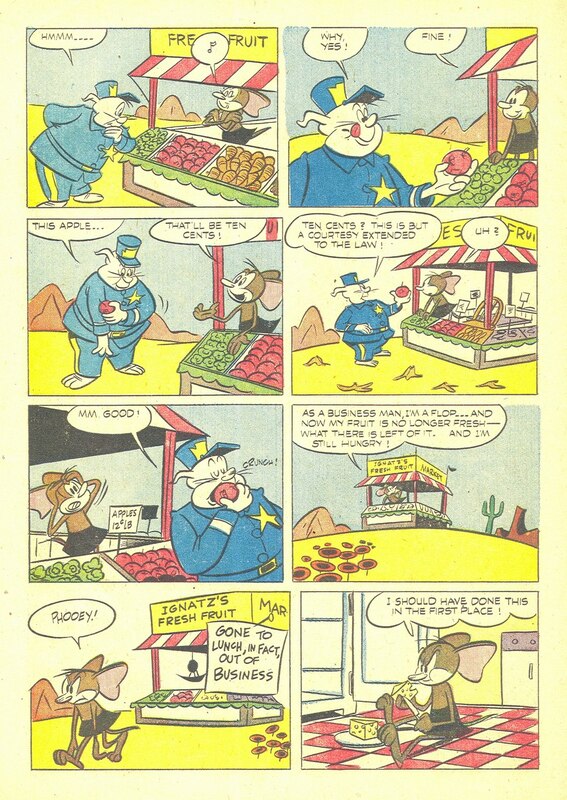 These were published in Dell's "Four Color" series--a 1300+ issue run that proves the utter validity of Sturgeon's Law as refers to funny-books. I detect some of Stanley's hand in the finished artwork of these stories--perhaps it's just the influence of his layouts, more strongly felt than usual, in the final versions. 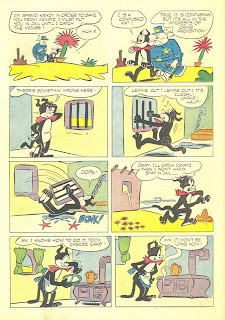 In this later run of Krazy Kat, Stanley embellished the original love-hate triangle created by originator George Herriman. One notable change: Krazy, him/herself, has become more of a loose cannon than in the 1951/2 run. 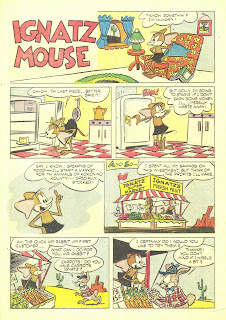 He/she often competes with Ignatz Mouse for the "Tubby Type" role in these stories. 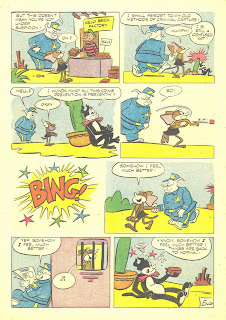 Ignatz still triumphs as the Tubbiest of the lot, but in having two unpredictable figures playing against a staunch authority figure (Offissa Pupp), Stanley gives himself more license for character-driven comedy. 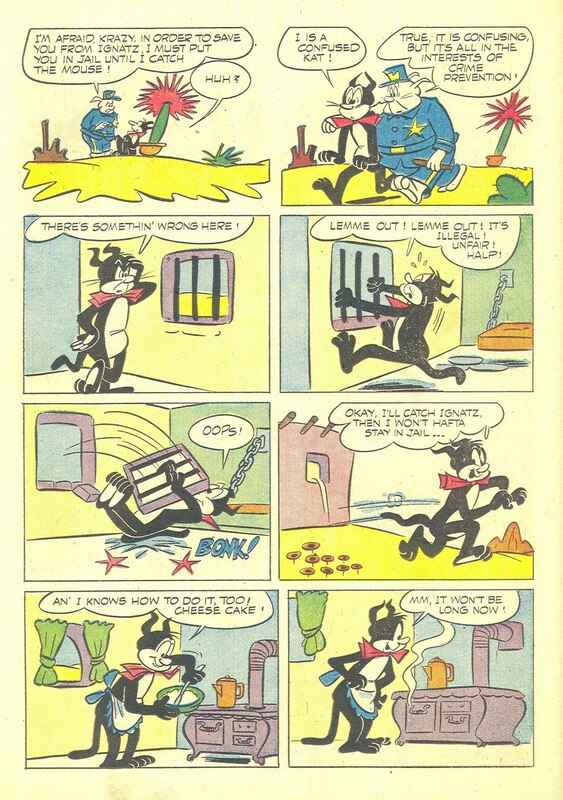 In this second run of Krazy Kat, Stanley has relaxed into the characters, and is more confident about adding personal touches to a forbiddingly private world. 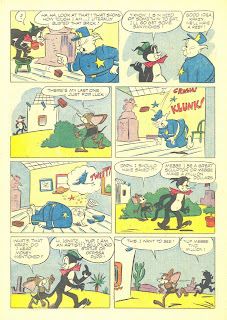 John Stanley was of the right age to have been enormously affected by George Herriman's original version. To hip readers of the 1920s and '30s, Herriman was the comics' godsend. 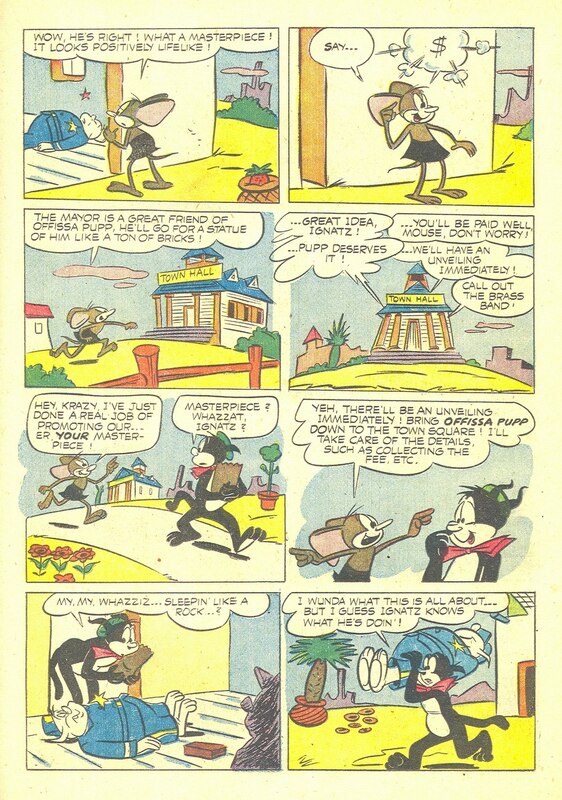 To the average reader, Krazy Kat was a migraine source--best skipped en route to "Tillie the Toiler." 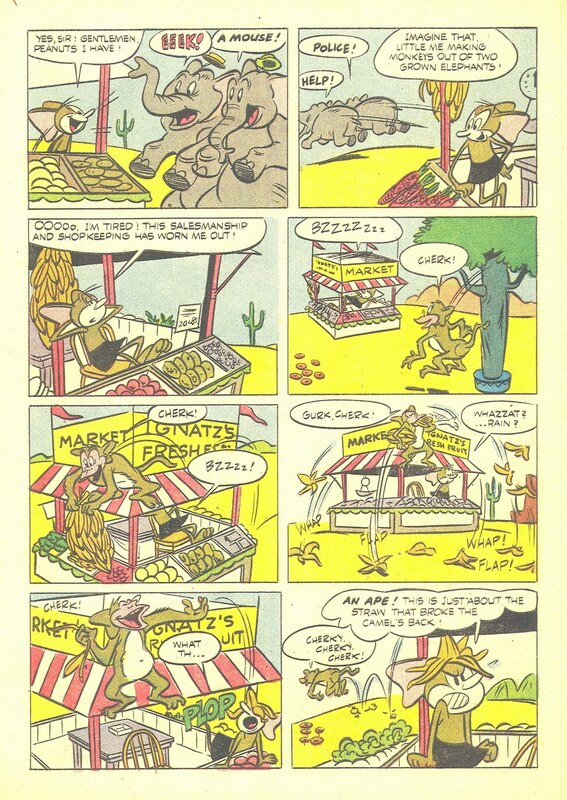 Walt Kelly's Pogo attracted a similarly adoring, fervent fan base in the 1950s. 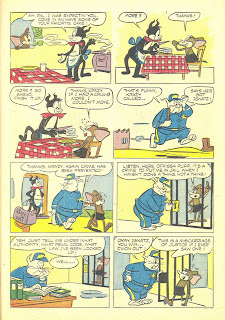 Kelly's work made a bigger impact on The Average Joe, circa 1952, than Herriman's did in its prime. 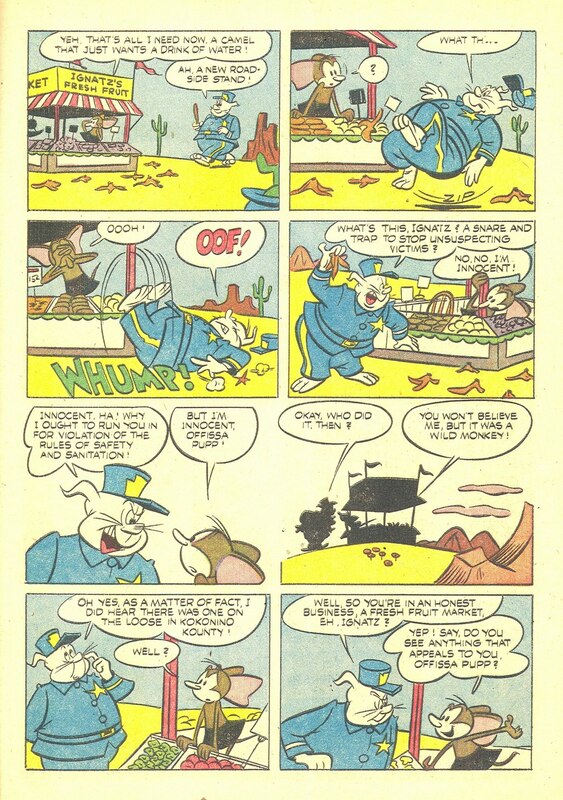 While comics scholars and more adventurous readers still see plenty to love in the work of Herriman and Kelly, the average reader of 2011 is hard-pressed to find a point of entry into either man's work. 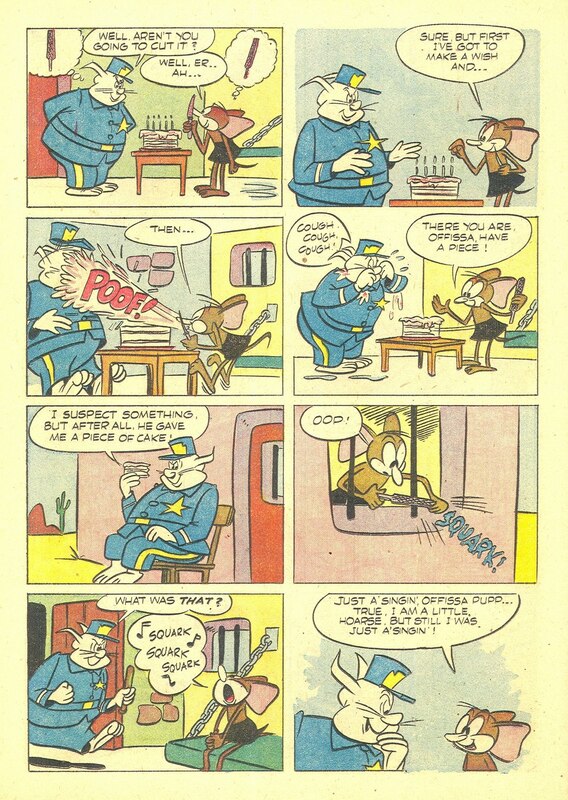 Both creators' intensely playful use of phonetic language does not scan well in an increasingly less literate world. 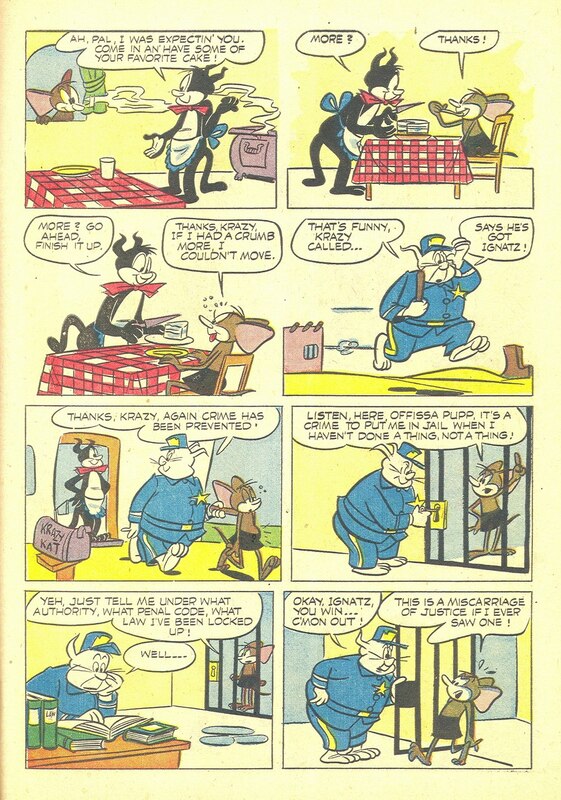 Kelly's contemporary political references, especially in the 1950s daily strips, while enlightening for those who know history, can be baffling to uninformed newcomers. 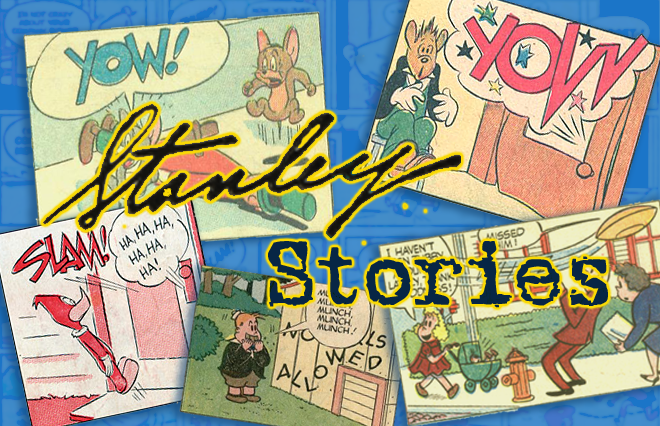 By 1955, Stanley had fully honed his sensibilities as a writer and storyteller. 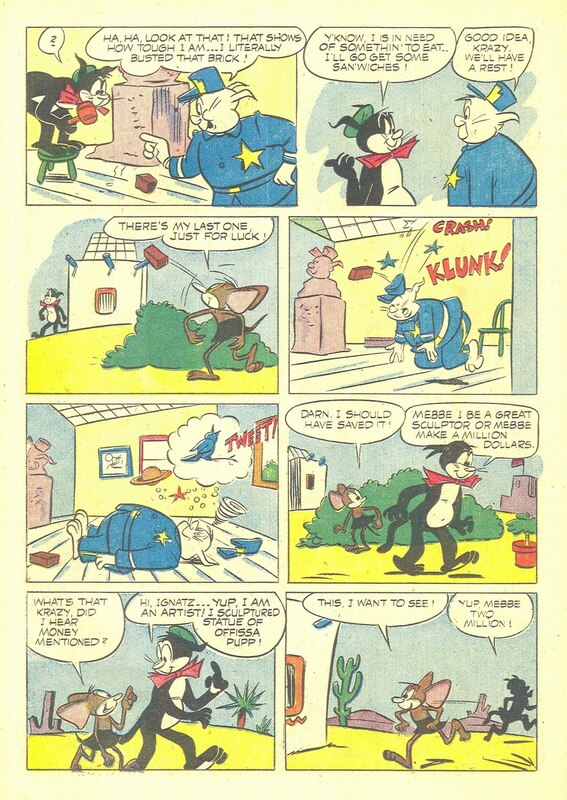 In the 1951/2 Krazy Kat, Stanley handles the characters timidly, as if they might bruise easily. 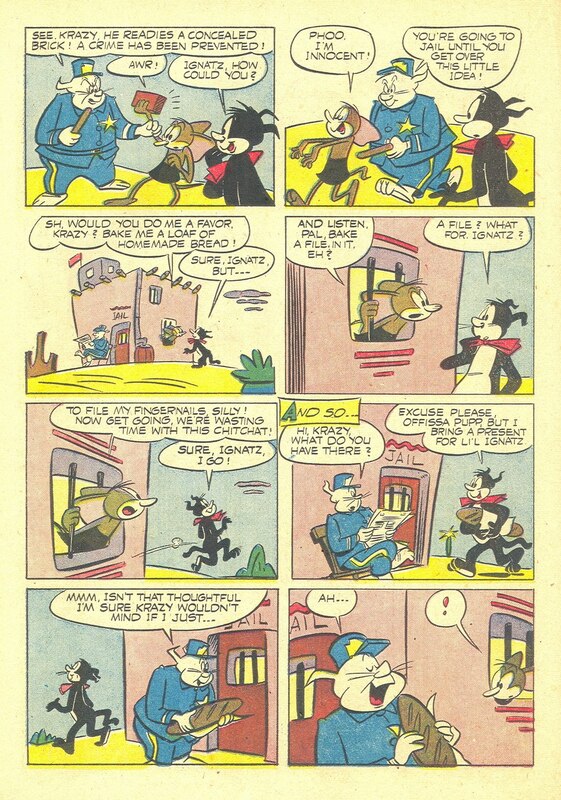 A few years later, he more forcefully blends his ideas with Herriman's creations. 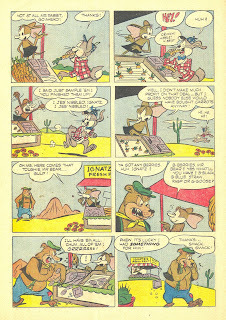 His wordplay dominates these later KK stories--in a way that, coincidentally, ties them with Kelly's contemporary Pogo. Kelly and Stanley were colleagues, and obviously admired each other's work. 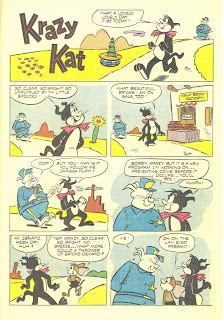 I think Stanley was trying to do a Pogo with these Krazy Kat stories--not an imitation, but an attempt to connect rich elements in a similar manner. 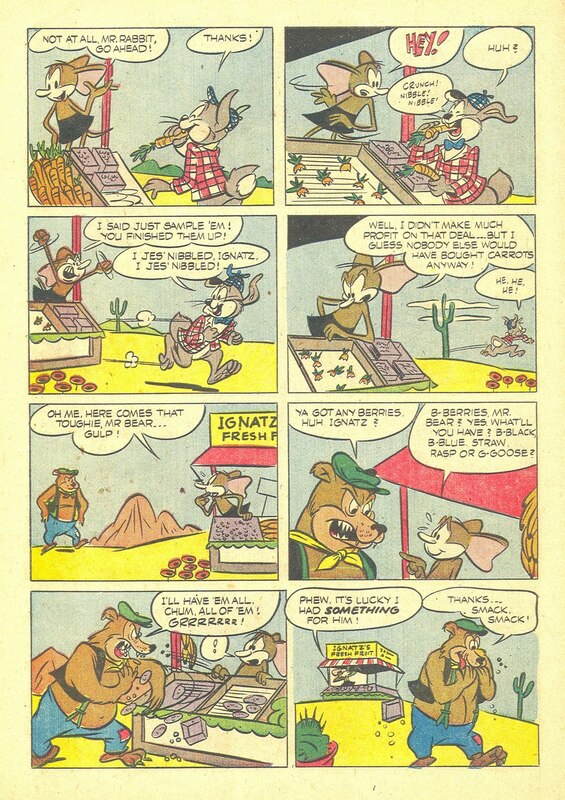 Back to the comics: Ignatz attempts to enter the world of commerce, with vexatious results, in this untitled solo story. 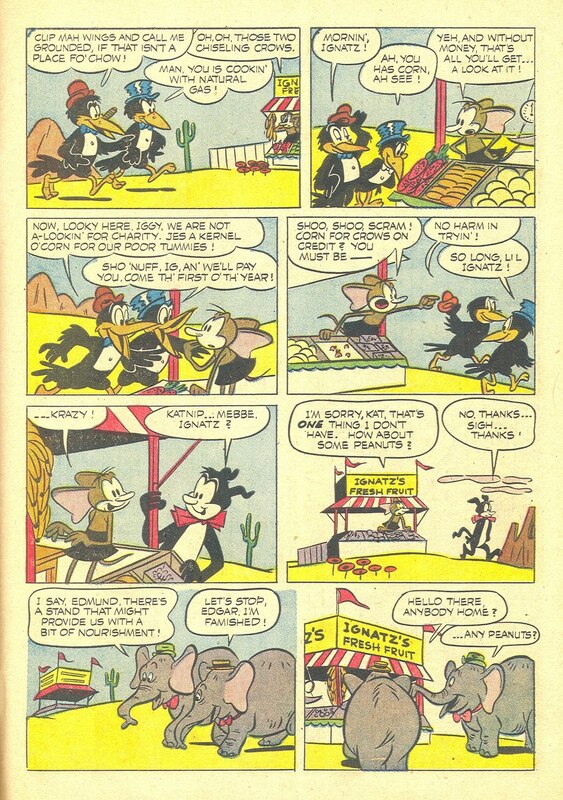 Like Stanley's version of Woody Woodpecker, Ignatz is an agitated outsider. His attempts to mesh with the everyday world end in frustration and disappointment. 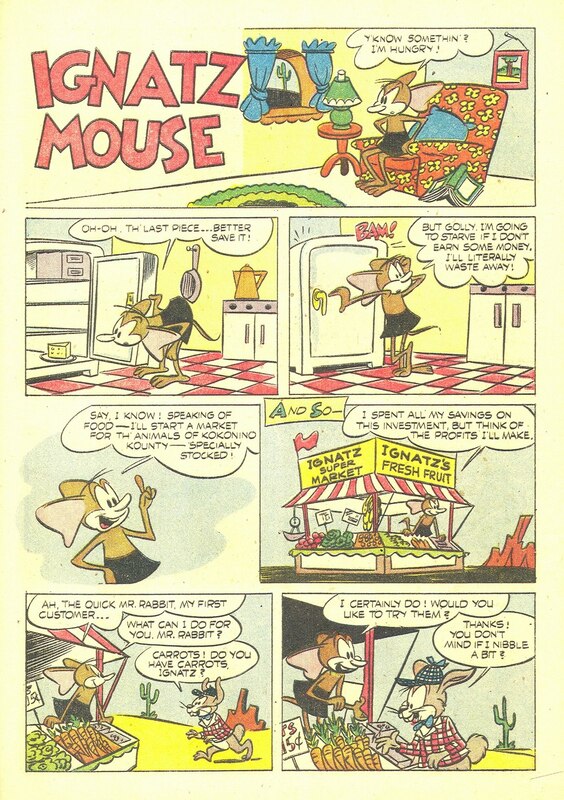 Here, the mouse is victimized by various species--he forgot to remember that his clientele tends to be predatorial! His only potential paying customers--the elephants--freak out due to that old elephant-fears-mouse business. 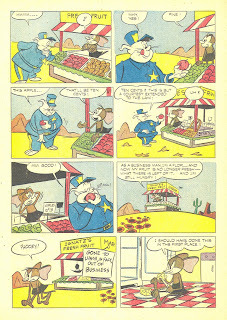 Even stalwart authority figure Offisa Pupp refuses to pay a dime for an apple. 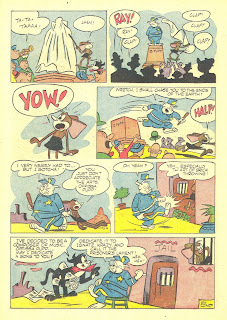 Ignatz admits defeat soberly, without a temper-tantrum or other destructive urges. 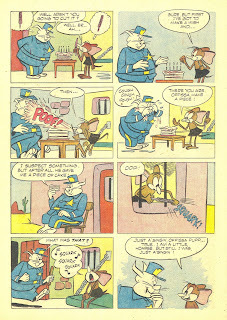 One genuinely feels sorry for him, at story's end. I've saved the best for last. Anytime a John Stanley story involves a creative act, such as painting, poetry or sculpting, an odd reflex kicks in. His creators are typically suspect figures--and their admirers and financiers deluded, decadent fools. 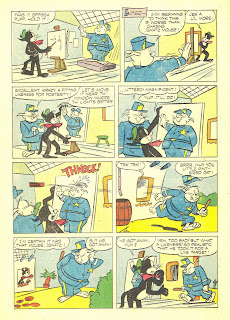 The naive, sweet-natured Krazy defies Stanley's general attitude towards artists. His/her creative impulse is applauded and supported by the self-important Pupp. 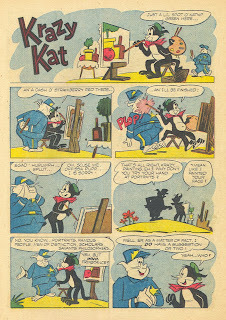 Krazy's kreative kwalities are only thwarted by the jealous, resentful Ignatz--who simply can't stand for the kat's attention to stray from him for too long. 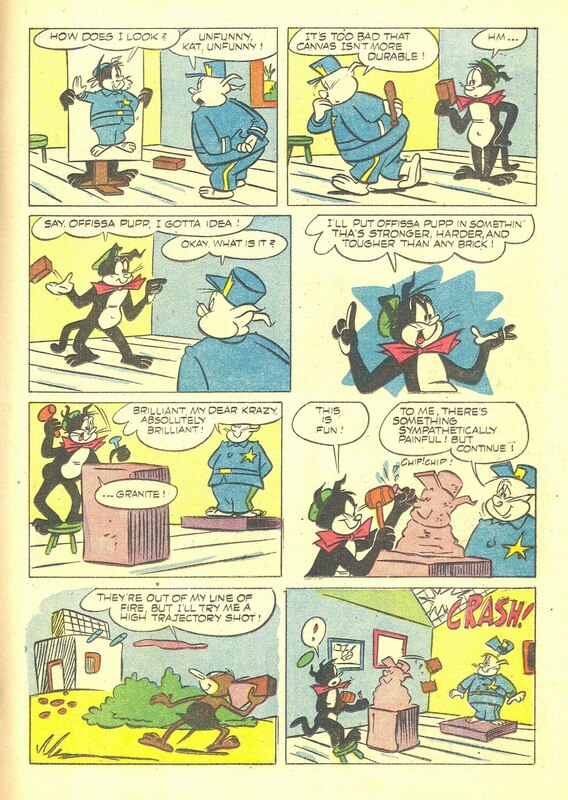 The disastrous unveiling of a sculpture is a repeated comic trope in Stanley's work. It was, apparently, a moment he savored in his stories. The unveiling of a comatose Pupp-as-statue elicits a genuine YOW! 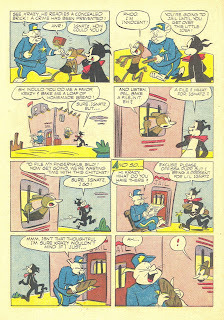 from Ignatz. 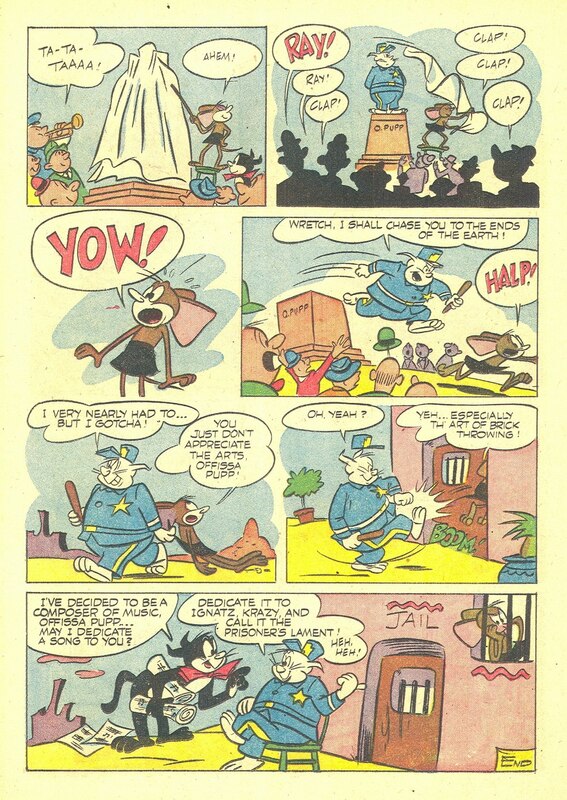 While Stanley does not condemn the artist as a phony in this story, he gets comic mileage from the piece of art itself being deceptive. 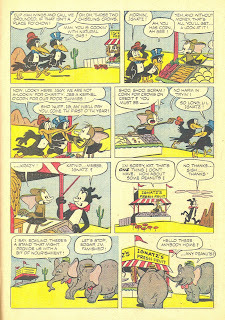 Krazy's cheerful myopia allows him/her to mistake the KO'd, prone Pupp as her handiwork. 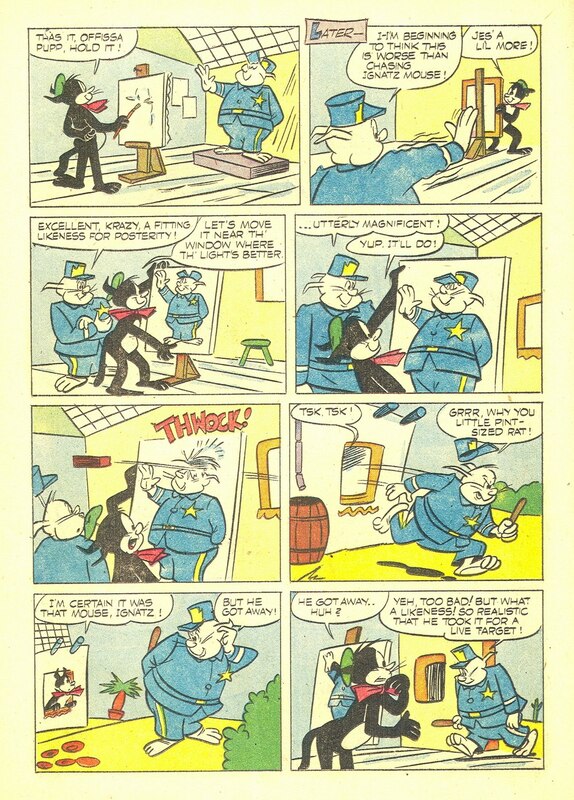 Pupp makes the most of his shock-value unveiling, and nabs his usual suspect in the resulting fracas. 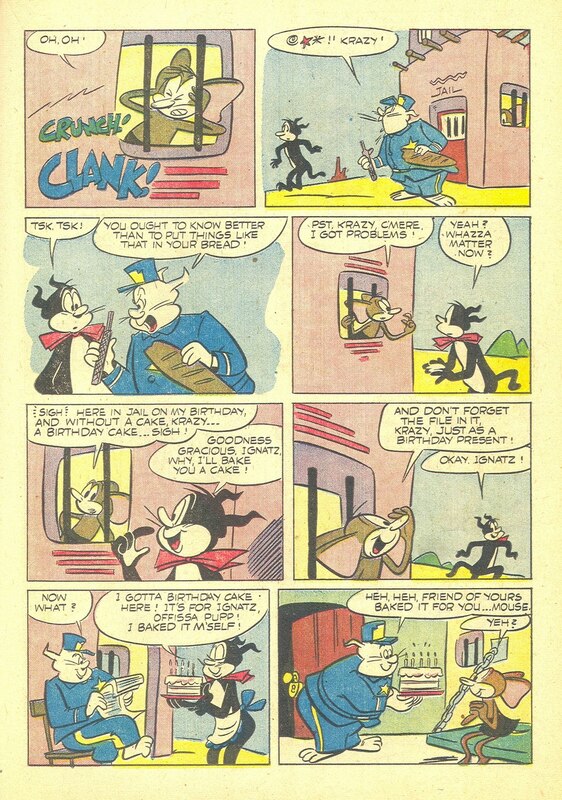 It's a clever touch, but the story's last page again reinforces Stanley's apparent belief that artists--and their admirers--are absurd. Stanley made a living from his own relentless creativity and problem-solving. It seems odd that he had such an apparent axe to grind about artists and their world. 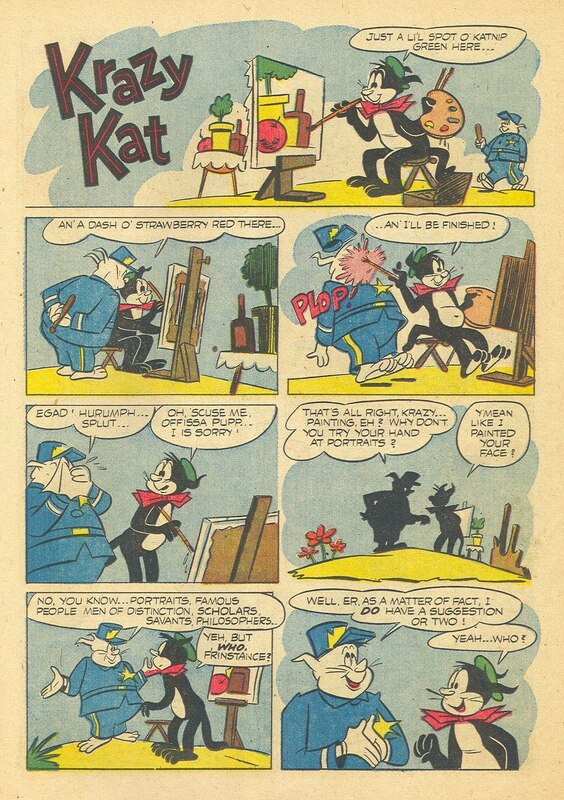 This situation shows up far too often in John Stanley's work--from start to finish in his career--to be a coincidence. Is this some kind of self-hatred, creeping into his work? John Stanley isn't around to answer this question. 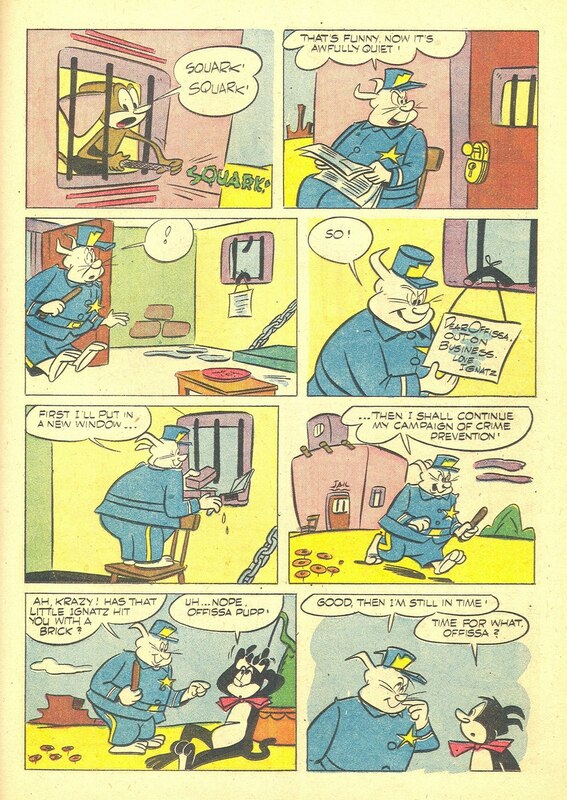 The dark side of his work stems, I believe, from this apparent self-loathing. 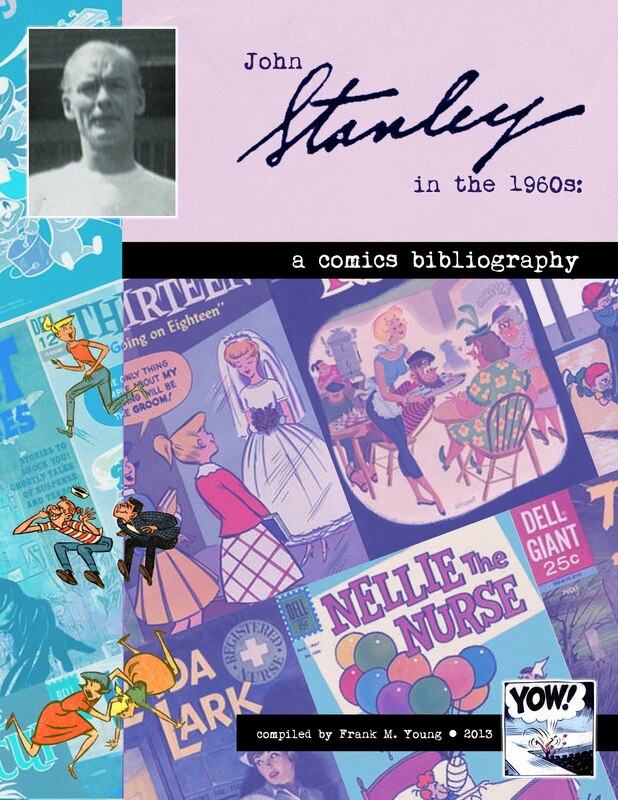 Stanley was dismissive of his efforts, in the one or two interviews of his that I've read. Although his muse came through for him like clockwork, he seemed not to have much faith in it. Right from the beginning, I always felt ‘I can’t do another’ at the completion of every book—there never seemed to be an idea left in me. Stanley's best work appears almost effortless. 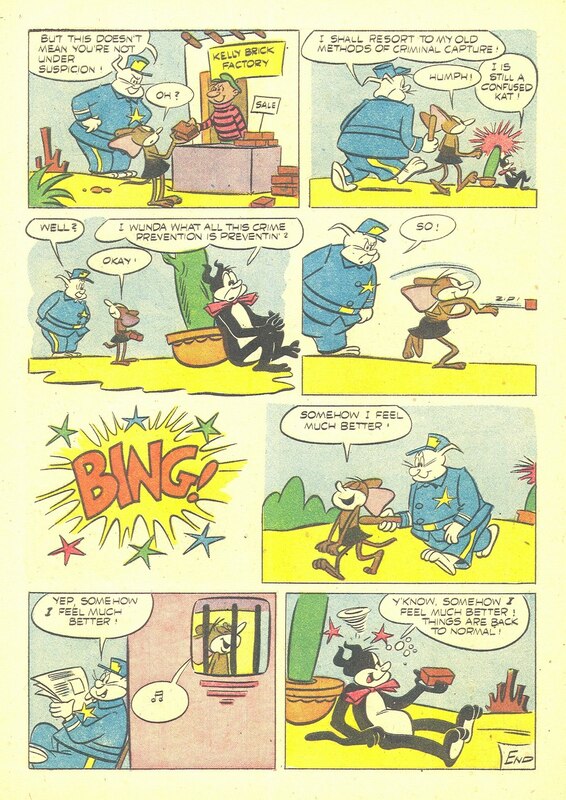 Like Harvey Kurtzman's artwork, it appears spontaneous to the spectator, and does not betray the blood, sweat and tears that went into its creation. 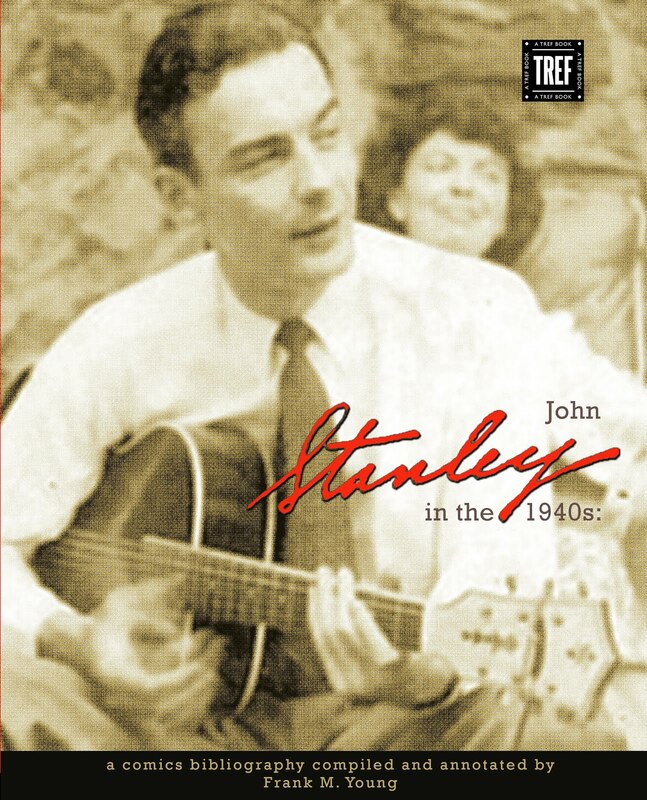 Was creativity a constant struggle for John Stanley? If so, it was a battle he successfully fought for 25 years. 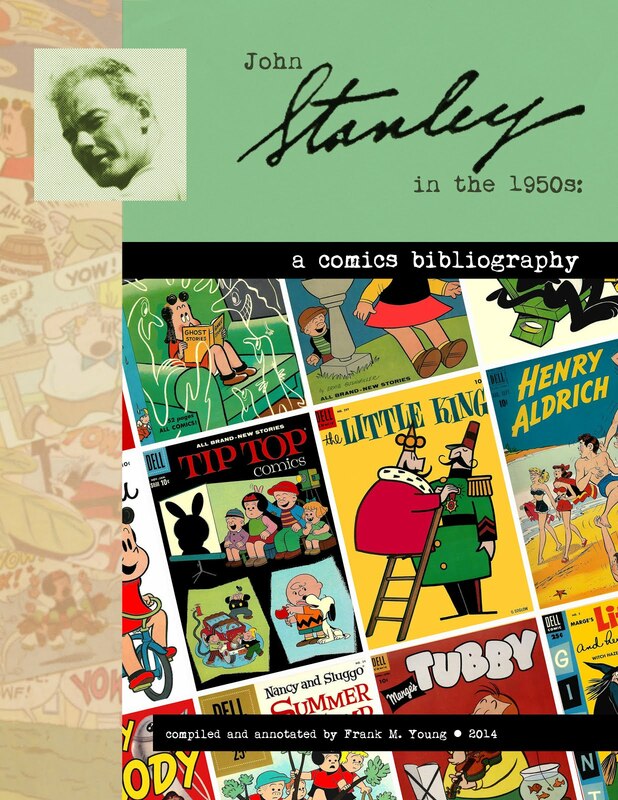 Stanley was a heavy smoker and drinker. His son, James, in an interview for Alter-Ego magazine in 2005, matter-of-factly states: "He suffered from depression and alcoholism." 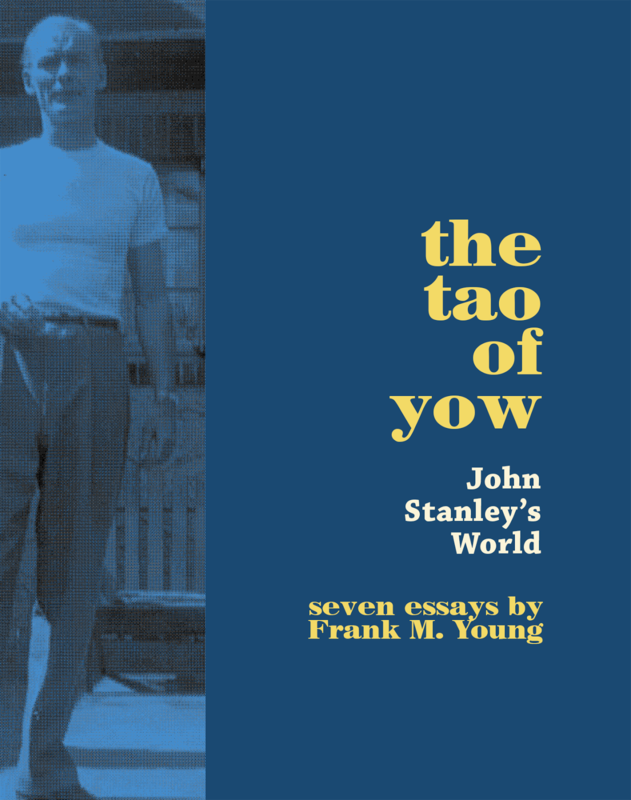 Jim Stanley speaks more about his father's state of mind in this fascinating and honest interview. 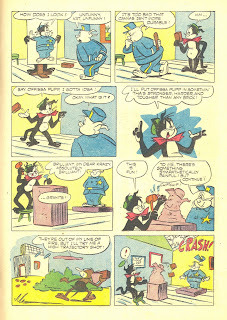 Both this and the 1965 newspaper piece on John Stanley can be found in issue 54 of Alter-Ego magazine. This is a sobering note on which to end this posting. We know so little of John Stanley the person. His work leaves behind apparent, tantalizing clues that it did not come easily to its creator. Creativity can often be a difficult, demanding process, as any writer, artist or musician can tell you. The golden moments, when one seems to be merely the messenger of inspiration, are gruesomely outweighed by uncertainty, confusion and those sad moments of I-got-nothin'. We are fortunate that John Stanley could consistently set his demons aside to write, and sometimes illustrate, transcendent comics stories. Knowing that they apparently did not come easily to their creator gives us more to savor and appreciate about the work itself.